I’ve previously mentioned that the “Jen Special” involves fish, starch, green vegetable. Over the years, I’ve tried to expand what the “Jen Special” means. Originally, it meant baked salmon, mashed potatoes, and spinach. Without fail, I had this dish at least once a week before I moved in with B. Moving in with him lead us to be a little more creative because someone prefers variety. This is the latest manifestation of the “Jen Special”. Enjoy! Combine basil, olive oil, pine nuts, garlic, Parmesan cheese, salt, and pepper together in a food processor until smooth. Add additional components to taste. Preheat oven to 350 degrees F. Spray a baking dish with non-stick spray. 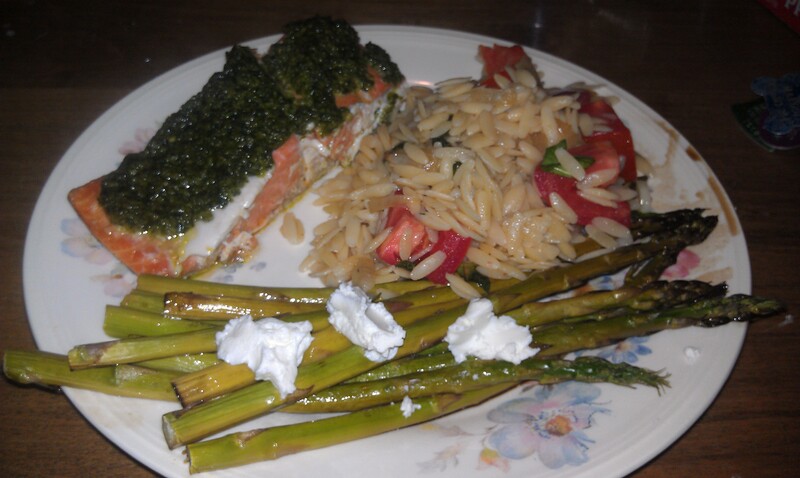 Place salmon in dish and spread pesto on top. Bake salmon for approximately 20 minutes or until the salmon flakes easily with a fork. In a pot, bring heavily salted water to a boil. When water reaches a rolling boil, add dried orzo. In a separate saute pan, add olive oil and onions. Cook onions about 15-20 minutes, stirring frequently, until caramelized. Set aside onions. Add pine nuts to the pan and toast slightly, making sure not to let them burn. When orzo is cooked, drain and add to pan with pine nuts and onions. Mix in tomatoes, feta cheese, and balsamic vinegar. Serve warm. This was just a bunch of asparagus that I blanched. I added dollops of goat cheese and drizzled store-bought balsamic glaze.